So I got an offer for a new job. What a relief! I won't lose my house and I can keep buying yarn. I finished the bibs for my nephew and finished a scarf for myself that I started so long ago that I lost the ball band and can't give you any info. on the yarn. I do remember that it's a hand-dyed wool blend. It's incredibly soft and cushy, too. 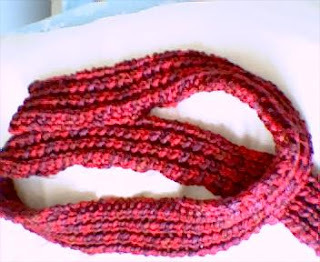 I used size 11 needles and the mistake stitch rib pattern (15 stitches) to make a long, skinny scarf. I know I don't need any more scarves, but the yarn was expensive (see? I do remember a few details), and I couldn't buy more than 1 skein.